As aid agencies do their best to respond to the crisis in Nepal, digital marketing expert Richenda Vermeulen says a fresh approach and a strong framework will get them through – and allow them to get more help to those who really need it. Our heart goes out to everyone affected by the tragedy in Nepal. As aid agencies rush to help, and our friend Joy is in Nepal to do emergency communications, I’m reminded of the earthquake in Haiti – my first disaster response effort. It was a time of almost no sleep, constant stress, and seesawing between feelings of tremendous responsibility and helplessness. I wish I knew then what I know now. If you’re working in Marketing or Communications at an aid agency, I hope this helps in some small way. The first minutes, hours, and days are a waiting game to declare the category of emergency. With Haiti, it happened quick. With famine, it happens (painfully) slow. In Nepal, an emergency state was declared within the first 48 hours. Meanwhile, Not for Profits are slow because they need approval from six offices to send an email. Not for Profits are slow because they wait for media coverage before making the decision to fundraise. If you work for a Not for Profit: don’t get stuck there. If you work at a Not for Profit you’re the voice of the people affected. A strong plan of action is measured in hours, not days. Donor attention follows media attention, so your window of opportunity is likely to last only one week (168 hours). Make it count. You don’t need to have all the answers: start talking to donors straight away. Being human and saying something real is better than a press release. Don’t wait to craft the “perfect” response. With infrastructure destroyed, offices shook, and staff affected, the first 24 hours are painful. Don’t wait to start updating people that care with your “official statement”. The most dangerous phrase in emergency response. INGO Marketing = When we know all the details and funding needs, we’ll launch our campaign. The most important thing is to make sure that we have all the information and all stakeholders agree before we take action. Growth Marketing = Our analysis tells us people are talking about this. We need to share what we know right away and find creative ways to get the message out. We will constantly create and refine. The most important thing is to make sure we never stop trying new avenues. In an emergency, the INGO marketing approach is never enough. 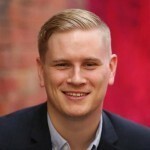 Try to think like a growth marketer. Have regular brainstorms to create new solutions and approaches. Use insights from real-time data and analysis to guide your thinking. Never stop at one solution, always be thinking: “how we can do this better, go deeper?” Leaders – give your team the freedom to make things happen. The biggest debate inside Not for Profits is often what budget to fundraise for (designated or undesignated). Designated funding slows organisations down. Don’t let it slow you down. 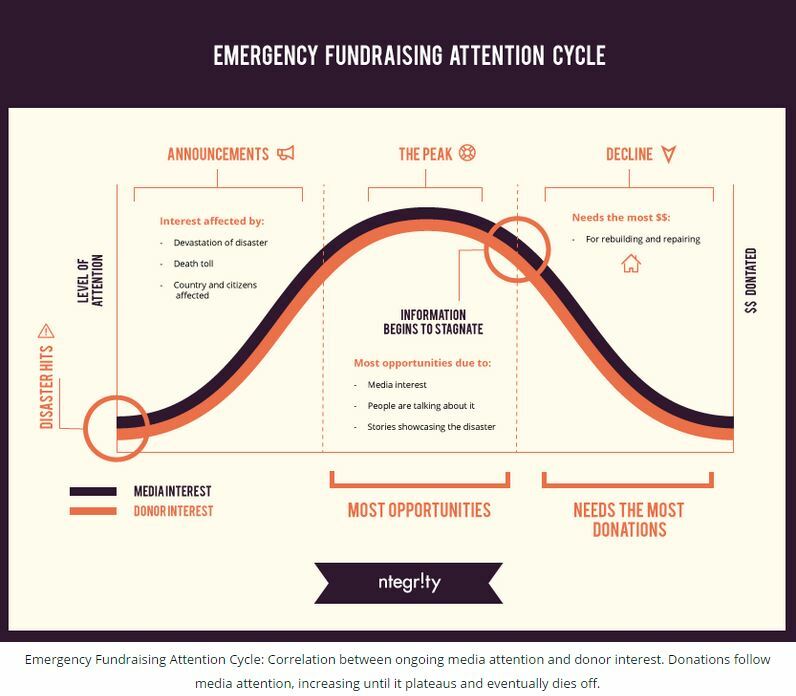 If your organisation isn’t ready to commit to designated funding, start fundraising for a general emergency response. Never has the term “time is money” been more true. 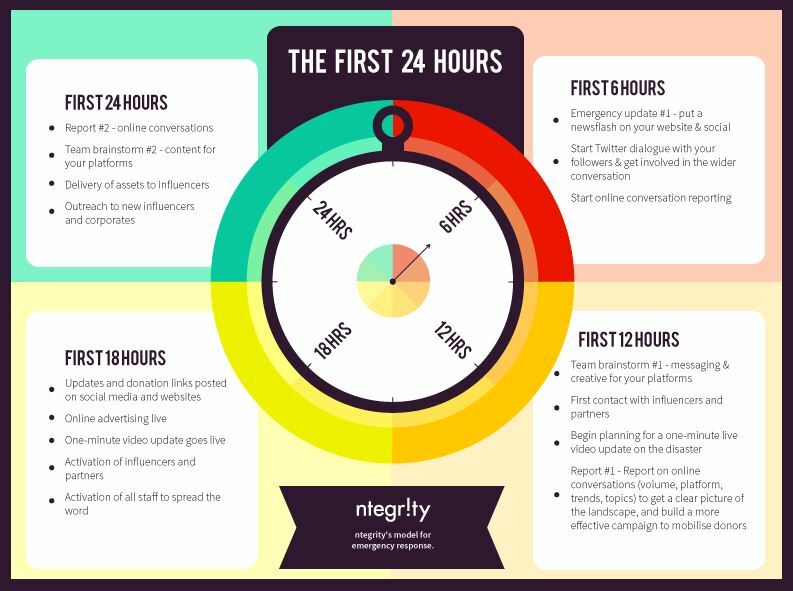 The first 24 hours are critical – here’s how a growth marketer would approach the challenge. Remember: this will be a stressful time. A fresh approach and a strong framework will get you through – and allow your aid organisation to get more help to those who really need it. This post started as a conversation we (Richenda Vermeulen and husband Kyle) had over dinner. We both previously worked for World Vision, and 15+ combined years working in Not for Profits. As we’ve both now moved to agile, startup companies, we believe there is a lot large organisations can learn from startup marketing. Our hope is to encourage those on the front lines of communication and fundraising for NGOs to move quickly, and deeply connect with donors during this stressful time. Hang in there, friends.